Starting with a simple D6 dice pool mechanic, this game intuitively builds on its core concepts. The rules detail dramatic systems for task resolution, advancement, trials of belief, tests of nerve, searing social conflict, dangerous sorcery, miraculous faith, and brutal, gut-wrenching martial combat. Behind the dice, your decisions drive the game's systems. Their choices tangibly affect every outcome - from glorious victory to ignominious defeat. But there are consequences to every decision, ramifications to every action. The choices you make close off one path, while opening another. This philosophy underpins the character creation system for Burning Wheel. And it's not just a matter of pushing a point here, or nudging a number there: As soon as a player decides to make a character in Burning Wheel, he is confronted with decisions about the character's past, ethics, beliefs, scars, goals and dreams. Questions whose answers affect not only the player's character, but the shape of the story as a whole. Burning Wheel is presented in an easy-to-read writing style, with plenty of insight and advice from the designer. If you're not careful, Burning Wheel will change the way you play roleplaying games. 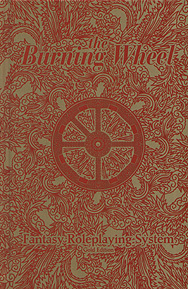 The Gold Edition combines both the Revised Edition's Burning Wheel and Character Burner. It has been reorganized for clarity and updated by the author.